Years After the Financial Crisis, Lower Manhattan Office Occupancy is More Diverse than Ever. companies like the Associated Press, the Meredith Corporation (formerly Time Inc.), the College Board and J.Crew as some of its biggest occupants. This diversification is also apparent in employment trends. Professional Services employment is at its highest level in LM since at least 2001 - 51,332 employees, up nearly 50 percent since the depths of the recession in 2009. Information sector employment, which includes jobs in media and publishing, is just 5 percent off from its most recent peak in 2001 with 12,083 employees today. If you work in Lower Manhattan today, you’re almost as likely to be working in Information or Professional Services as you are in Financial Services or Insurance. The timeline illustrates the milestones in Lower Manhattan’s office market diversification and the post-2008 economic expansion. Photo: iStock, By Getty Images. Trace Rouda. BounceX, one of the fastest growing software companies in the United States, signed a deal to relocate from Times Square and expand to a 79,118-square-foot office in One World Trade Center in early October. NEW LARGE DEALS SCARCE BUT TAMI AND FLEXIBLE SPACE PROVIDERS STILL ACTIVE Technology, Advertising, Media and Information (TAMI) and Flexible Space Providers continued to be Lower Manhattan’s strongest dealmakers in the third quarter, now accounting for more than 43 percent of all new activity year to date. While more active south of Chambers Street than the Midtown market, these industries are currently the majority of new activity in Midtown South, accounting for more than 76 percent so far this year. WeWork was especially active Manhattan-wide in the third quarter and announced their new ranking as the largest private occupier of space in Manhattan overall with over 5.3 million square feet. In Lower Manhattan, the company has seven locations. They signed the largest third quarter deal when committing to a 76,814-square-foot expansion in 85 Broad Street. The 319,000 square foot location is the company’s largest in Lower Manhattan. Knotel inked the second largest deal of the quarter with their plans to open a fourth location in 110 William Street. The expanding flexible space company signed a lease for 36,848 square feet on the 17th floor. Lower Manhattan also recorded several smaller relocation commitments from TAMI companies. PR Newswire, a press release distributor and communications company, will be relocating from Hudson Square to 33,866 square feet in 200 Vesey Street at Brookfield Place. They will join Associated Press, a fellow media company, in the building. The World Trade Center remains a draw for technology and advertising companies. Undertone, a digital advertising firm, inked a deal for 25,550 square feet on the 77th floor of One World Trade Center. Framestore, a motion picture visual effects company, is relocating from SoHo to a 24,479-square-foot floor in 61 Broadway. Other recent TAMI relocations signed at 61 Broadway in 2018 include Hello Alfred, a digital personal and home services manager, and Collibra, a data governance platform company. NONPROFIT AND EDUCATION TENANTS RENEW AND EXPAND LOWER MANHATTAN ROOTS Other deals signed this quarter reflect Lower Manhattan’s ongoing appeal to existing tenants especially in the nonprofit and education sectors. Posse Foundation, a nonprofit leadership training organization renewed and expanded by 10,000 square feet at 14 Wall Street. They will now occupy an entire 36,345-square-foot floor. Pace University signed a lease for 23,041 square feet in 52 Broadway, also home to King’s College, to expand classroom space for their Actors Studio Drama School. Finally, the Hawthorne School, a school focused on children and adults with autism and other developmental disabilities, expanded by 12,261 square feet in 156 William Street, also home to The Blue School. RAFAEL VINOLY ARCHITECTS JOINS 100+ ARCHITECTURE AND DESIGN FIRMS SOUTH OF CHAMBERS STREET One of New York City’s most well-known architecture firms, Rafael Vinoly Architects, committed to move to 375 Pearl Street after 28 years in Hudson Square. The designer of 432 Park Avenue will relocate to the 36,550-square-foot top floor in the recently repositioned tower. Lower Manhattan has welcomed a steady stream of architecture and design firms relocating from Midtown South in recent years including CetraRuddy, CallisonRTKL, Morris Adjimi Architects and Cooper Robertson Partners. TWO OF THE MOST IMPORTANT NAMES IN DIGITAL MUSIC ARE LOCATED IN THE WTC In the third quarter, Broadcast Music, Inc. (BMI), a music royalty, publishing and licensing organization, signed the largest renewal of the quarter at 7 World Trade Center for 61,390 square feet. The music rights management organization has been located in Lower Manhattan since 2010 after relocating from Midtown. BMI licenses much of the music played by Spotify, which is headquartered in nearby 4 World Trade Center. percent, according to Cushman & Wakefield. Nationwide, the overall average vacancy rate among central business districts is 12.5 percent, up slightly year-over-year and each Manhattan submarket remains tighter than the national average. In the third quarter, the vacancy rate increased slightly to 12 percent, rising for the third consecutive quarter, according to Cushman & Wakefield. Space additions in properties such as 28 Liberty and 32 Old Slip as well as below-average quarterly leasing activity pushed the rate up from 11.3 percent in the second quarter. While sublet space has increased in Lower Manhattan over the past year, the marketâ&#x20AC;&#x2122;s sublet vacancy rate of 1.5 percent still remains slightly below that of Midtown and Midtown South - 1.8 percent. The majority of the largest blocks of space remain in the World Trade Center and the Financial East submarkets, which account for about two-thirds of all available space. With the addition of 28 Liberty and 32 Old Slip, the Financial East submarket experienced a 16 percent expansion in available space. Other large blocks in this submarket include 55 Water Street (269,764 square feet) and 120 Broadway (203,749 square feet). AVERAGE ASKING RENT REACHES NEW PEAK IN LOWER MANHATTAN WITH STRONG SUPPLY OF CLASS A SPACE ON THE MARKET Lower Manhattan’s overall average asking rent reached a new peak for the second consecutive quarter as it crept up to $63.70 per square foot. This rise can largely be attributed to the addition of higher priced Class A space at 28 Liberty and 32 Old Slip to the market. This pushed the average Class A asking rent to a market high as well, reaching $67.20 per square foot, up 6.8 percent year-over-year. Similarly, the average Class B asking rent remains near its historical high at $55.40 per square foot. Midtown South trended in the same direction, with its overall average asking rent reaching $76.40, a new historical high for the market and also trumping Midtown’s overall average asking rent for the first time in the markets’ history. Midtown South’s average Class A asking rent jumped 10 percent in the third quarter to $93.40 due to the completion of several new Class A office buildings in the Meatpacking/Chelsea area. rents in Lower Manhattan and Midtown has narrowed to the closest point since the beginning of 2004; Lower Manhattan’s average Class A rent is $15.60 below Midtown’s average. At the same time, the average Class A asking rent for available Lower Manhattan space offers the greatest discount in the market’s history as compared to availabilities in Midtown South. Lower Manhattan’s Class A average asking rent is $26 per square foot below the average asking rent for space on the market in Midtown South. THIRD QUARTER PROPERTY SALES Lower Manhattan’s property sales market remained subdued in the third quarter. 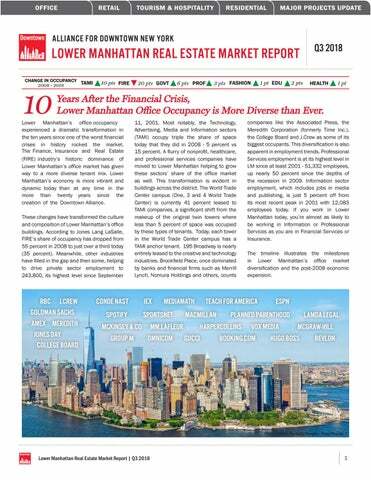 OFFICE Lower Manhattan logged two office transactions in the third quarter. The largest transaction was executed for 101 Barclay. The Bank of New York Mellon purchased the land underneath 101 Barclay for $352 million from the City of New York. The bank has owned the building since the early 1980’s and recently consolidated its 4,500 employees there after relocating operations from Brookfield Place. This marks the largest property transaction in Lower Manhattan year-to-date and a strong vote of confidence in Lower Manhattan by BNY Mellon. The Shapiro Group purchased 21 Park Place, a 9,686-squarefoot building, for $9 million or about $929 per square foot, from the Lions Group NYC. Most recently, the building has been used as a retail property. Tents & Trails had occupied the base of the building since the early 1970’s before closing earlier this year. The new owners plan to redevelop the property but exact plans remain unknown. MULTIFAMILY In August, Brookfield Asset Management announced (but has not yet closed on) its purchase of Forest City Realty for $6.8 billion. This transaction will also include the trade of 8 Spruce Street, a 903-unit luxury rental tower completed in 2012. This deal estimates the value of the rental tower at $520 million or about $576,000 per unit. 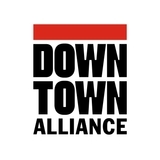 Great Empire Realty purchased the Down Town Association Building at 60 Pine Street for $28.3 million or $575 per square foot from the Down Town Association in a sales-leaseback transaction. The 49,000-square-foot office building is fully occupied by the Down Town Association. HOTEL Urban Commons, a Los-Angeles based real estate firm, purchased the 298-room Wagner Hotel at the base of 2-10 West Street, for $147.3 million or about $494,000 per hotel room from Westbrook Partners and Millennium Partners. The hotel was previously branded as a Ritz-Carlton Hotel, and Westbrook and Millennium Partners rebranded it to the Wagner Hotel, an independent brand. The rest of the building contains 120 condominium units which were previously branded as RitzCarlton residences. This transaction is the third closed hotel transaction in Lower Manhattan in 2018. RETAIL After a quiet first half of the year for retail trades, two transactions closed in the third quarter. Maxim Capital Group, purchased a 3,451-square-foot retail condominium at the base of 108 Chambers Street, an 8-unit residential condominium building expected to be complete in mid-2019, from the building’s developer, Greystone Development. The transaction closed at $10 million, valuing the retail space at $2,898 per square foot. The building’s retail condominium is already in operation with Vitamin Shoppe and Starbucks at the base of the building. 101 Barclay Street BNY Mellon purchased the land underneath their already-owned headquarters at 101 Barclay, signalling their confidence in Lower Manhattan. RETAIL MARKET New Openings and Announcements Lower Manhattan retail continued to expand in the third quarter of 2018. Pier 17 opened in the Seaport District and a variety of new retailers opened across the district. By the end of 2019, Lower Manhattan will have more than 7.28 million square feet of retail -- an expansion of 2.92 million square feet since 2014. Pier 17 debuted its concert series, in partnership with Live Nation, in the Seaport District. 10 Corso Como opened its first concept shop in the U.S. in the Seaport District. •	Alamo Drafthouse announced it will open its second NYC movie theater in the lower levels of 28 Liberty Street in late 2019. The 40,000-square-foot dine-in multiplex will have 14 screens and a separate bar; •	Brooklyn Chop House, an Asian steakhouse, opened at 150 Nassau Street; •	Ambassador, a Japanese fashion and design boutique, opened at 49 Warren Street in TriBeCa; •	QB House, a barber shop hailing from Tokyo, opened at 18 John Street; and •	Fast casual eateries continued to expand across Lower Manhattan, including Taïm at 75 Maiden Lane, The Kati Roll Company at 22 Maiden Lane and Proper Food at 67 Wall Street. Seamore’s welcomed guests to its new Brookfield Place location at 250 Vesey Street. TOURISM & HOSPITALITY Record Year for Tourism Lower Manhattan continues to be a growing destination for tourists. In 2017, approximately 13.6 million tourists visited Lower Manhattan, up nearly eight percent from 20161. An estimated 17.4 million unique visitors (a figure that includes residents of New York City and the surrounding area who don’t work or live in Lower Manhattan) visited the district in 2017 — a 17 percent increase from 2016. Visitors from throughout the city and the tri-state area were likely drawn to well publicized new destinations such as the Oculus and Brookfield Place. As a whole, New York City welcomed a record number of 62.8 million tourists in 20172. This was an increase of 2.3 million over 2016. •	The AC Hotel New York Downtown, at 151 Maiden Lane, recently opened in mid-October with 271 rooms. The hotel will also feature an independent restaurant to be announced at a later date; •	The Moxy NYC Downtown, at 26 Ann Street, opened in late October with 298 rooms. The hotel also features Recreation, a coworking space by day and cocktail bar by night; and •	T he Artezen Hotel, will bring 89 hotel rooms to 24 John Street and will have a Ground Central coffee shop at the base. The AC Hotel New York Downtown opened at 151 Maiden Lane with 271 hotel rooms. An independent restaurant will also be at the hotel’s base. With 12 hotels and 1,900 hotel rooms under construction or in the development pipeline (including the 658 rooms in three hotels expected to open in the remainder of 2018), inventory is expected to increase by up to 27 percent in the next few years. If all projects continue as planned, the hotel inventory in Lower Manhattan will reach 9,019 rooms in 45 hotels by 2020. The Moxy NYC Downtown opened this fall at 26 Ann Street with 298 hotel rooms. The hotel will also feature Recreation, a cocktail bar and coworking space. Occupancy and Average Daily Room Rate The third quarter’s average occupancy rate was 87.2 percent -- three percentage points below the citywide average1. The occupancy rate of Lower Manhattan hotels decreased by three percentage points from Q3 2017. This is the second consecutive quarter where occupancy has decreased year-over-year, both by three percentage points. While occupancy has trended down, average daily room rate (ADR) is going the other direction. This is the second consecutive quarter where Lower Manhattan’s ADR increased year-over-year. In the third quarter of 2018, ADR in area hotels was $266, up one percent year-over-year. New York City’s ADR1, about $20 more than Lower Manhattan’s ADR, also increased slightly, by 2.4 percent year-over-year to $287. Positive signs on the horizon include growing tourism, expanded retail and restaurant offerings, and new and repositioned office product which are expected to continue to drive business and leisure travel to Lower Manhattan. The positive outlook for demand generators and a slowdown in citywide hotel development are encouraging hotels to push room rates higher, despite a modest dip in occupancy year-over-year. Additionally, efforts to regulate the booming home-sharing industry, including legislation recently adopted by the New York City Council, could reduce the availability of units listed by companies such as Airbnb. This could shift some demand and pricing power back to the hotel market especially on key sellout nights. •	19 Park Place - The narrow 21-story, 24 condominium tower, developed by ABN Real Estate, is wrapping up construction and expects a temporary certificate of occupancy in late 2018; and •	49 Chambers Street - The Chetrit Group’s conversion of the the historic Emigrant Savings Bank anticipates closings to begin this November, adding 99 condo units to the market. Residential Rental Market Metrics According to residential statistics published by Miller Samuel/Douglas Elliman, the median rent in Lower Manhattan increased slightly to $3,795, up 1.5 percent from this time last year. Meanwhile, Manhattan’s overall median rent also trended up slightly, at 0.9 percent year-over-year to $3,445. Residential Sales Market Cools Slightly Continued fluctuation and correction in the residential sales market in Lower Manhattan reflected the expiration of the legacy contract pipeline for condos, as well as rising mortgage rates and downward pressure from the recent tax overhaul. Similar trends are being seen across Manhattan overall. The median sales price for co-ops and condos dropped to $931,500, down nearly 7.5 percent from last quarter and 30 percent from the previous year. This is the first time since the first quarter of 2016 that the median sales price fell below $1 million. Similarly, while Lower Manhattan’s average price per square foot (PPSF) of $1,285 saw a decrease of ten percent over the past quarter, the year-over-year decrease was around 28 percent. Fisher Brothers & the Witkoff Group’s 62-story 111 Murray Street opened with 157 condo units. The Blue School Expands The Blue School, an independent private school founded by members of The Blue Man Group, has expanded into an additional space at 156 William Street, a few blocks west from the original 241 Water Street location in the Seaport. The new, four-story, 45,000-square-foot space serves students in the 4th through 8th grade and features flexible classrooms, library, STEAM lab, a gymnasium that doubles as an auditorium and commons area with a microgreens garden. The original 241 Water Street location now serves pre-K through 3rd grade. The new expansion will allow the school to double its capacity to 600 students over the next decade. Carmel Partners opened its 64-story, 483-unit rental tower at 19 Dutch Street this past summer. Metroloft’s conversion of 20 Broad Street into 533 rental units welcomed its first residents in early fall. This was the first time since Q1 2016 that median condo sales prices fell below $1 million. Lower Manhattan condo sales are returning to normal patterns as the luxury legacy contracts - 3Q 2018 empty. Lower Manhattan condo sales are returning to normal patterns as the luxury legacy contracts empty. The WTC Cortlandt 1 Train station officially reopened after being destroyed on September 11, 2001, forcing trains to bypass the station for over 17 years. The remodeled station features a white, monochromatic marble mosaic with text from the 1776 Declaration of Independence and the 1948 United Nations Universal Declaration of Human Rights. The station opens directly into the west side of the World Trade Center Transportation Hub. Separately, entrances from the new 3 World Trade Center tower into the transit hub are expected to open by the end of next June. Trinity Real Estate’s 74 Trinity Place, a new 26-story, 310,000-squarefoot office building, has begun to rise. The bottom five floors will be for community use, floors six through eight will be used for Trinity Church’s offices and the remaining 17 floors will be rentable office space. The existing pedestrian bridge across Trinity Place will remain and eventually be reconnected to Trinity Church. The $350-milliontower is expected to open in 2020. The Ronald O. Perelman Performing Arts Center at the World Trade Center (The Perelman Center) The Ronald O. Perelman Center for Performing Arts at the World Trade Center, known as The Perelman Center, signed a 99-year lease with the Port Authority in February 2018. The Center has raised $295 million, or 82 percent of its expected $363 million construction cost. In conjunction with the lease signing, the Port Authority will also receive $48 million from the Lower Manhattan Development Corporation for below-grade construction. Additionally, the board of directors of the Perelman Center announced the appointment of its first artistic director, Bill Rauch of the Oregon Shakespeare Festival. The approximately 110,000-square-foot cube-shaped building will feature three theaters of varying sizes, which can be combined in different seating configurations and formats for an array of unique performance environments. The Perelman Center will be located at the site of the now demolished PATH entrance at Greenwich and Vesey streets, which closed when the World Trade Center Transportation Hub opened in summer 2016. The project began construction in fall 2017 and anticipates opening for the 2020-2021 season. NYC Ferry Expands Service The final two of the six NYC Ferry routes launched this summer with service to the Lower East Side and Soundview (Bronx). The other routes include the pre-existing East River Ferry service and lines to the Rockaways, South Brooklyn and Astoria. These new routes have proven popular, as ridership hit 4.8 million cumulative riders since the service launched in May 2017. Due to the better than anticipated demand, additional funds have been allocated to pay for larger boats, a second home port and other infrastructure upgrades to accommodate increased rider projections. These routes have 20 landings across the city, including a newlyannounced homeport landing at the Brooklyn Navy Yard that will be part of the East River Route. All routes stop at Pier 11-Wall Street. One-way tickets cost $2.75.